The first slowdown was supposedly caused by the El Nino/La Nina. 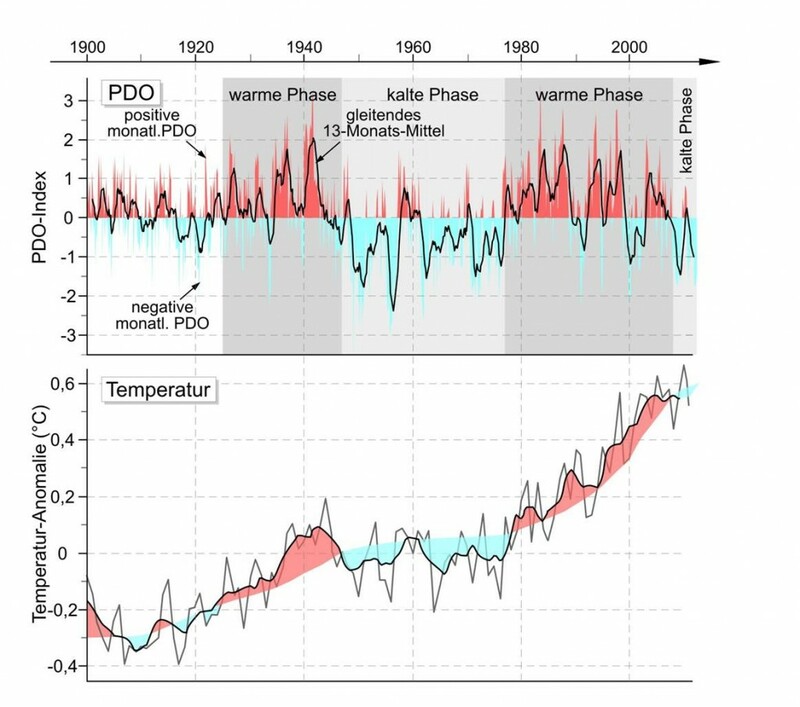 An ocean cycle, in any case, but it’s odd there’s no mention of the PDO. And the third slowdown supposedly had something to do with a combination of El Nino volcanoes. Folland and his colleagues are pulling tricks like real troopers. 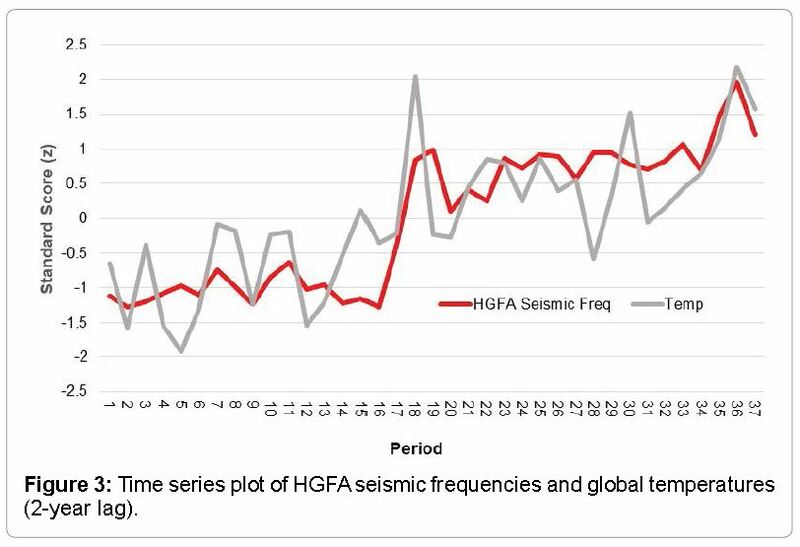 In the abstract the authors mention the sun putting the brakes on the recent slow warming. But at phys.org there’s no mention of that. And if the sun can put the brakes on, then it can also accelerate. Yet in the models there is no room for that because supposedly almost all the warming of the last 120 years has been caused by greenhouse gases. Under the bottom line the authors concede nothing to climate variability. Instead the volcano card gets played when all else fails. 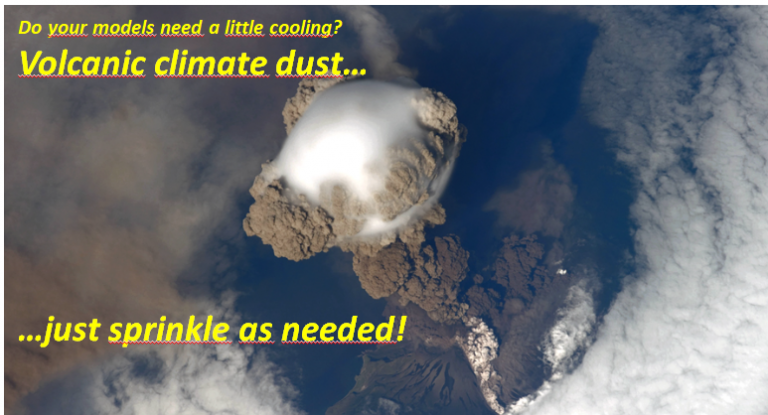 Whenever there’s need for some cooling, volcanic dust gets sprinkled in the computer climate world. One has to wonder how rubbish like Folland et al makes it through peer review. Oh silly me with IPCC compliant papers it is “pal review”. Must be volcanic dust keeping the temperature down to a measly 0.21ºC above the “average” of the climb out of the coldest period since the LIA. Maybe there has been an increase in volcanic activity, to cool all the non-warming from human CO2. This is from Nasa’s (James Hansens) GMCII modeling radiation. You don’t have to know any programming just read the comments what the program tries to do. Care to enlighten us what specific comments you mean? I thought it was funny to see how much he wanted to do with so many unknowns and volume of static parameters. He had huge faith in that little machine and his assumptions. Strategy looks to have been if I guess about plenty enough errors will cancel out and result gets accurate. Guess it was only my type of humour. No. I found it mildly amusing as well. But you don’t have to apologize to SebH about anything he doesn’t find amusing. Chatbots have no sense of humor. Thanks for the link and the support. A little something from Bill Grey on James Hanson’s errors, in a video on why the models are wrong. I added a response to this post 4 hours ago. It was not offensive in any way. It’s interesting that variability should be the root cause for global warming. Perhaps you also believe humans aren’t causing a general CO2 concentration increase because the seasonal variability is large compared to the yearly increase? Why shouldn’t variability account for warming? Or sometimes cooling? And who cares whether humans are causing an increase in CO2 concentration? It’s an entirely beneficial trace gas with no adverse side effects on human beings below 1000ppm atmospheric concentration. Graphs of 20th century temperature show at best spasmodic correlation between GAT and CO2 concentration and ice cores show that historically changes in CO2 concentration lag temperature changes by up to eight centuries. Which ought, to any scientist with an open mind, be enough to cast doubt on the hypothesis that late 20th century warming is being caused almost exclusively by an increase in CO2 concentration from 0.03% to 0.04%. In any event, according to Arrhenius, a doubling of CO2 concentration ought to result in a GAT increase of ~1.1°C. Anything beyond that would be pure speculation. So an increase in CO2 to 800ppm might increase GAT to ~15.3°C and it would need a further 800ppm increase to raise the GAT to 16.3°. Colour me less than thrilled! Misunderstanding the topic (what higher CO2 concentrations do) on purpose. So you don’t have any answers, Seb. Right? Answers? Did you ask anything? You made some hilarious claims, some in form of questions. That’s all. But I am curious, how would you classify your reply in this case since you failed to further elaborate why you think your claims are true? We are all living in bubbles, Newminster. Me being here is me investigating your bubble. Have you ever left your bubble? “one side of the equation” is referring to your mention of CO2 concentrations lagging temperature. It’s not a reasonable argumenent when you forget to mention that CO2 variations also causes temperature to change. We have limited information on past times when the CO2 concentration increase was caused by something other than a temperature increase, but we are currently in such a phase with us causing the CO2 concentration increase. Do you disagree? … indeed. I’ll repeat myself: great talk. Again with the ANTI-SCIENCE BS. There is ZERO- EVIDENCE that CO2 causes temperature changes. A bubble of ignorance and an EMPTY bubble of any actual evidence. Mindlessly chanting the AGW meme is NOT evidence. But its all you have. Let’s see you RUN AWAY like a headless chook, from those two questions, yet again. Arrhenius used a glass bottle to come up with his “idea” about CO2 atmospheric warming.. I suspect that seb thinks the world resides in a glass bottle. Yep, the models show that absolutely anything is possible but can not indisputably show that CO2 is the culprit of man-made climate change… it is after all just a very inadequate model of climate and not the climate itself. If it wasn’t for those pesky volcanoes, desert dust, solar variation, ocean cycle variations, clouds, etc. The main problem is that the basic climate science is not well known or understood. That is to say it’s not understood at least to level where computer models can be used to accurately mirroring how currently our climate works, or predict anything meaningful. The laughable thing is the UN-IPCC’s utter reliance on computer models despite saying “The climate system is a coupled non-linear chaotic system, and therefore the long-term prediction of future climate states is not possible.” and knowing that the models have many basic flaws. This is because they can not show any observed detrimental effect of rising atmospheric CO2 levels, and so these models are used by the UN-IPCC as very inaccurate proxy evidence for the imaginary effects of man-made CO2 in the atmosphere. Folland et al is SebH approved propaganda. The laughable thing is the UN-IPCC’s utter reliance on computer models despite saying “The climate system is a coupled non-linear chaotic system, and therefore the long-term prediction of future climate states is not possible.” and knowing that the models have many basic flaws. The part that is NOT laughable is that on the back of this fake UN-IPCC virtual evidence about CO2, the UN wishes to ensure that all Western governments pay their tithe (aka Carbon Tax), and that national economies, society and commerce, and the very way we live and trade should be altered radically. It started as Agenda 21 which changed to the UN’s ‘2030 Agenda’, both documents are a blueprints for UN socialists to rule every nation. With these documents, and the funding from ‘Carbon Tax’, the unelected, unaccountable UN will become a dictatorship of elites, technocrats, and crony capitalists. When your children grow-up they will be ‘encouraged’ into large cities, dissuaded from living the countryside as that will increasingly become over-expensive and turn into ‘protected’ wilderness areas. And the German government like all European governments have signed-up for it. And look-up their plans for cities and wilderness areas. That IS what all this argument about CO2, sustainable development, renewable electricity supply is about, the politic of the ‘New World Order’. The politics of the UN elites affecting everything in your life. People like SebastianH will say it’s all ‘conspiracy theory’, he’s just a UN_IPCC advocate so of course he’ll say that. Of course it’s not, the documentation above shows its not, those documents assume that man-made climate change is real and that all humans’ lives must change now because it is so. 1. Am I better off from doing this, do I have more freedom? 2. Who or what entity is in charge, and to who and how are they accountable. 3. With so few checks and balances offered in these documents, what will it cost, who pays, and who oversee the money? and so these models are used by the UN-IPCC as very inaccurate proxy evidence for the imaginary effects of man-made CO2 in the atmosphere. Just get off the internet, it’s nap time already! Take your meds and sleep the anger off for a while. The laughable thing is that you don’t understand that even chaotic systems can be predicted to a certain level. I mean I can say that as people age their hair will become gray, their eyesight will become worse, their reaction time will become worse and they will become more stubborn and as time progresses they will live longer and longer. Now we’re comparing hair color to weather and climate. Anything to avoid addressing the subject directly. I can even put numbers on these predictions using statistics. Try using them on the topic at hand: What will the average temperature of Vostok, Antarctica, be during March, 2044? Is there a model that can “put numbers on these predictions”? Yes or no? No, these models have been derived from observations. Uh, no. Predictions of future climate states based on modeling are not observations. Your insults and dishonest misrepresentations of what others have written are becoming even more sophomoric than usual. I would delete this, but then you would complain that you have been victimized. seb is definitely a VICTIM..
Of his own lack of brain functionality and lack of education in science, maths, physics, biology..
or any actual REAL science..
.. his own manic GULLIBILITY and egotistical ARROGANCE. He is constantly seeking attention in a pathetic attempt at self-validation, which he KNOWS he can never achieve. A psychiatrist could write a whole series of books on his self-delusional, self-preening behaviour. These attention seeking claims are really funny when you repeat them over and over while seemingly seeking for attention yourself. You should post less often if you want to convince people that it isn’t you who is seeking for attention here. How long ago was it you said you were going to respond to me anymore.?? But you just LUV the attention, don’t you petal. Your ONLY reason for posting. You can’t stop can you seb. Thanks for admitting you are a professional troll. That has been obvious from the start. Although, why anyone would pay for your INEPTITUDE and IGNORANCE is beyond me. You should post less, so you don’t continually make a goose of yourself with your headless chook ranting, but you need the income..
And what SebastianH willfully ignores is that that basic climate science is still an ongoing work in progress and no amount of modeling, of chaos and others processes, can not, will not fit. The models can not tell you how this earthly climate functions when basic parameters are misunderstood or are missing. Only the deranged could believe the models are by any stretch of the imagination, anywhere near correct now. Even the IPCC knows it is not so, as evidenced by this missive from them https://www.ipcc.ch/ipccreports/tar/wg1/501.htm. Observations are needed that would decisively improve our ability to model the carbon cycle; in addition, a dense and well-calibrated network of stations for monitoring CO2 and oxygen (O2) concentrations will also be required for international verification of carbon sinks. Improvements in deriving concentrations from emissions of gases and in the prediction and assessment of direct and indirect aerosol forcing will require an integrated effort involving in situ observations, satellite remote sensing, field campaigns and modelling. Why should they call for so many expensive improvements? That document outlines in detail that their dependence on the models’ have MASSIVE shortcomings. That document SebastianH tells you that you are wrong (again!). But still the UN via the IPCC wish to inflict gross change on the world without undeniable evidence that CO2 changes the climate. SebastianH believes CO2 does so without any evidence, only belief, and belief like a religion does not require proof it require unskeptical obedience to what the elites say. And that is all SebastianH has! That is exactly my point. Thank you for playing along even though I doubt you really understand my point if you think I was “comparing hair color to weather and climate”. Comprehension issues? I wrote: “No, these models have been derived from observations.” Not that predictions are observations. Why do you think that I wrote this? Really? You think this is a misrepresentation? You haven’t read the comments of your fellow skeptics on this blog here then (spike55 is always eager to provide an example of what he replies when the math goes over his head). I should not reply in kind to someone who tries to insult me constantly? At least I didn’t call him “a talking donkey” … or did that context also get lost while you replied? Do you need a refresher on those two questions you keep cowardly avoiding ???? NO they are NOT derived from observation. They are mostly derived from anti-science conjecture and baseless suppositions. There are ZERO OBSERVATIONS of atmospheric CO2 causing warming, ANYWHERE, ANYTIME, ANYHOW. The most laughable thing is your deliberate misunderstanding of chaos. You totally mischaracterize how, in trying to predict the result chaotic system, a very small a very small error in magnitude or alignment of any parameter sends the prediction off to a result completely at odds with reality. Your dishonest misrepresentations of comparing climate variability to the aging process, is hogwash! That analogy is NOT a close representation to how the climate works, it is a nonsense analogy. Your characterization thus shows that you are a charlatan and someone attempting to dupe others in to believing you are mathematically able. You are not you are a sham, a spreader of mathematical nonsense to cover up the total lack of evidence that increases in CO2 are anything but beneficial. Willis Eschenbach (mostly on the WUWT site) has looked at volcanoes, actually the role of v., in atmospheric cooling. I think, so far, he has found nothing. A mix of human UHI and airport heat spread out over huge areas of non-urban land, and a farcical agenda-based “adjustment™” regime that allows them to “create” basically whatever they want to create. a farcical agenda-based “adjustment™” regime that allows them to “create” basically whatever they want to create. So you DENY that many basically FRAUDULENT “adjustments” have taken place. Your only way out for your feeble mind. .. and just HOW EASY it is to produce the “desired” result. But IGNORANCE always was your only asset. Nobody expects ANYTHING of rational understanding from you any more. You really ought to seek your attention elsewhere, because you have been an ABJECT FAILURE at anything except mindless distractions here. With your abject ignorance and total inability to scientifically support even the most basic AGW meme, you are sending the AGW agenda crashing backwards into the dark pit it came from. Where is that evidence of CO2 warming, seb? That is what you should be producing.. but EMPTY!! You have shown over and over and over again, that your junior high level comprehension of maths, science, physic, biology etc are just not up to the task of rational debate. The fact that your comprehension of REALITY is further held back by your baseless arrogance and your hard-held anti-science AGW beliefs, makes you sound even more irrational.